Diwali in Uttar Pradesh is a grand affair. There is no dearth of enthusiasm and zeal when it comes to celebrating this festival in one of the biggest states of India. The celebrations in Uttar Pradesh last over a period of five days, like most of the other states. It begins with Dhanteras and ends with Bhaidooj on the fifth day. Diwali has numerous legends attached to it, but the most popular and widely believed one is about Lord Ram. Diwali in Uttar Pradesh is celebrated in honor of Lord Ram returning to Ayodhya after 14 years of exile on the orders of King Dashrath, his father. It is said that Lord Ram made the journey from Lanka, now Sri Lanka, after killing the demon King Ravan who had abducted Sita and taken her to his kingdom. Dussehra is celebrated. It took Lord Ram, Sita and Lord Lakshman 20 days to complete the journey. This is the reason why Dussehra is celebrated 20 days prior to Diwali, for it celebrates the killing of Ravan, representing the victory of good over evil. Ayodhya, Lord Ram’s kingdom is in the state of Uttar Pradesh, so is it any wonder that the celebrations will be anything less than spectacular. The celebrations in Ayodhya are similar, to the rest of the state, only more traditional and on a grander scale. Diwali is celebrated in the traditional way, with lamps and lights lighting up cities and towns, fairs and festivities, firecrackers, and worshipping Goddess Lakshmi and Lord Ganesha. Its commendable, how Uttar Pradesh, a large state with a sky rocketing population and diverse cultures, has kept the spirit and flavour of Diwali alive. Varanasi and Mathura are some of the other cities of Uttar Pradesh that celebrate Diwali in a manner larger than life. If you want to be a part of the most traditional and conventional Diwali, these are the cities you should visit. 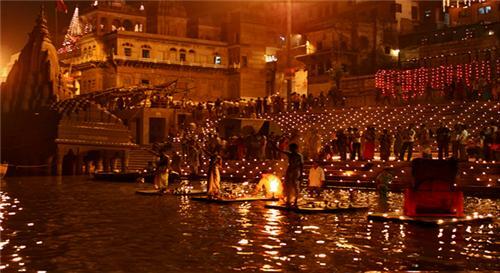 Diwali in Varanasi or Benaras is majestic, to say the very least. Prayers are offered to goddess Lakshmi and people collect around on the banks of the river Ganga while pandits (priests) perform the rituals and carry out the prayer proceedings. On Diwali, the day begins with people taking a dip in the Holy Ganges – Ganga Jal ( Ganga Water) is a major part of all religious proceedings in Hindus, its considered pure, holy and auspicious. After the Ganga Snan (bathing in Ganga), people flock to the streets and market places to explore the fairs and melas – a trademark of Diwali. Mithai (Indian sweet-cakes) and glittering outfits are bought in honor of the festival. On the main evening of Diwali, millions of people perform puja on the ghat (bank) of the holy river Ganga and light diyas (clay lamps) for aarti and then let the diyas slowly float into the river. Can you imagine the kind of image that must create? Millions of diyas floating in the river, creating a dream-like mirage of the river coming to life and light is enthralling, if nothing else. Varanasi is worth a visit during Diwali, if only to see this particular sight.